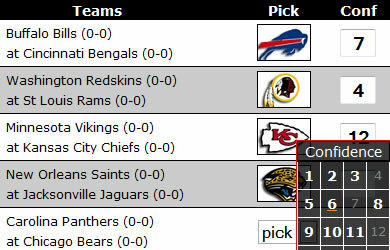 NFL Confidence pools are a lot of fun because they allow you to make your picks like any other full picksheet NFL pool, however, with a very neat twist. You place your confidence on each game based on how much faith you have that the teams you choose will win. You have 1 each of the values from 1 to 16 (in a 16 game week, less in bye weeks) and you must be strategic about how you place them. Get a game right where you have placed the 15s and 16s, and watch your points rack up quickly. Use your 1s and 2s for games you are not so confident about. Notice in the example here, the confidence level is high on the first two games, but on the third game, the player is not so sure, so he put only 1 pt at risk.